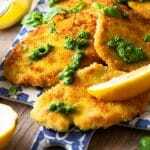 These Italian Chicken Cutlets are crispy, juicy and full of flavour. Served with baby spinach tossed in homemade pesto and freshly squeezed lemon juice. This recipe is simple but sure to be a favourite, perfect for any day of the week! Cut each chicken breast in half using a sharp knife. Place each cutlet in between two sheets of cling film (plastic wrap) and beat it evenly with a rolling pin or meat mallet until 0.5cm / 1/4 inch. Get three bowls ready, one filled with flour, one with beaten egg and one with breadcrumbs seasoned with salt and pepper. Dip each chicken cutlet one at a time into the flour, followed by the egg and finally the breadcrumbs. Press it slightly to ensure the cutlet is evenly covered in breadcrumbs. Add olive oil to a large skillet pan, once hot add the chicken cutlets and brown on each side (around 3 minutes each side) the cutlets don't take long because they've been beaten thin. Once cooked transfer to a plate covered with kitchen paper to drain for a minute before serving. Toss the pesto with baby spinach and serve with the chicken cutlets and lemon wedges, make sure to squeeze the lemon over the chicken. It helps to dip the chicken in egg with one hand and keep the other hand free for the breadcrumbs, that way you don't get in a sticky mess. Panko breadcrumbs are the best for this recipe because they are super light and crispy but you can also use regular breadcrumbs. Beating the chicken with a rolling pin or meat mallet helps tenderise the chicken making is extra juicy and delicious. Make the pesto in advance but toss it with the spinach last minute before serving to avoid it wilting. You can prep the chicken in advance and store it in the fridge on a plate or container cover with plastic wrap. This makes dinner even fast and all you need to do is fry them when you're ready to eat. In the Fridge - Leftovers will keep well in the fridge for up to 3 days, you can easily reheat them by playing on a baking tray in a preheated oven (200C/400F) for around 10 minutes until piping hot all the way through. In the Freezer - You can also freeze leftovers in a suitable container. To reheat from frozen simply place the frozen cutlets on a baking tray in a preheated oven (200C/400F) and bake for around 20 minutes until piping hot all the way through.